Horsham have struck a deal with Premier Division outfit Dorking Wanderers to bring Kieran Lavery back for a second loan spell. The former South Park forward joined the Hornets in December for a month long loan to rebuild his fitness having missed six weeks through injury. He made six apperances in that time and will now remain with Dominic Di Paola's promotion chasing side until the end of the season. 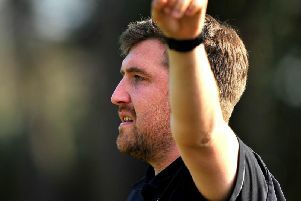 It shows a real sign of intent from the club to continue their successful season which has taken them to third in the Bostik League South East Division. A club statement read: "We are happy to announce that an agreement has been reached with Dorking Wanderers to take striker Kieran Lavery on loan until the end of the current season. "Kieran spent a month with the Hornets in December on a similar arrangement and, although failing to find the net in six appearances, proved himself a useful addition to the squad. "It is hoped that his experience and eye for goal will play its part as the side looks to reinforce its promotion credentials over the coming weeks and months." He will again join up with his former strike partner Chris Smith with the pair having played for many seasons together at Reigate-based South Park.